My Grandma, The Maestro – Small Town. Small Times. My Grandma Lovins was always right — even when she technically wasn’t. Her way of doing anything — unpacking groceries, storing linens, cutting radishes — was the only was to do it. She was so exact about her practices that no one dared make a move without being told how. She orchestrated everything. My grandmother was The Maestro. When I was little, my cousins and I bonded over her bossiness. We made fun of her, taking turns imitating her commands while we played with the musty toys she kept in the guest bedroom. We snuck black olives off her holiday table and giggled over the matching pajamas she would buy us every year. We were co-conspirators, linked by disdain for her order. My parents got divorced when I was eight. After that, I didn’t see her much. She was my dad’s mother and despite the amicable parting, my working mom didn’t have time to drive us across state to visit. She became a distant presence that passed through occasionally in a birthday or Christmas card. Then when I was in college, I went to live with her. My student loans had run out and I needed to a place stay while I regrouped financially. My grandma lived an hour from campus and my mother lived across the country. Living with my grandma meant I could be close enough to visit my friends on the weekend. She generously invited me to stay as long as I needed. The first few weeks were awkward. We move around each other timidly. As the newness wore off, she began teaching me how she wanted things done and I fell into step quite easily. I was a perennial pleaser and once you knew her rituals, she was easy to please. I knew how she wanted the table set: a salad fork at her place –not a heavy dinner fork, two sets of salt and pepper shakers because my grandpa got them “too greasy,” a blue plastic juice glass for her because heavy water glasses hurt her shoulder. She kept her own special margarine because she claimed she needed to “watch her cholesterol,” even though everything she cooked was slathered in butter. As I learned the special jobs and requirements, an ease grew between us and we began to enjoy each other. Secure in her world because I knew the expectations, I benefited further because I was a grandchild. She was older and softer by the time I got to know her. We often sat up late at night watching Johnny Carson and she would me the stories of her life: living on a farm, being a nanny to a famous senator’s son, her turbulent divorce from her first husband. I loved her drama in the details. She loved having an audience. If I shared with her a problem, she would roll up her sleeves and get to work. She could easily mull for days, giving me a recess from worry. She analyzed enough for the both of us. I got a break. Her structure and predictability were a welcome respite from the transitions of early adulthood. I loved that her penchant for worry and drama matched my own. As long as she was around, I could never feel alone. We became very close. Decades later when she was living alone in a nursing home I visited as often as I could. At first I made a big effort. I took her out to the beach and we ate pizza. I brought her bunches of pink carnations (her favorite) and planted Amaryllis bulbs for her at Christmastime. I made her lemon cake, and we spent visits discussing what to put in my garden. But the nursing home depressed me. It got harder to visit regularly once I had two small daughters. Over time, she became harder to engage. She lost interest in my garden. She lost interest in the details of others. She kept talking about dying and threatened she wouldn’t live much longer. I stopped coming by as often as I used to. Torn and guilty, I feared her disappointment in me. Two days later she had a major stroke and died. Her funeral was on a gorgeous day. My aunt and I picked out her casket — metallic and light blue, her favorite color. She was buried in the pretty suit she bought for my wedding. I gave a eulogy that I had scribbled recklessly that morning. It barely sufficed. After the service I went home and drank a lot of wine. Today, November 11th, is her birthday. And she is everywhere. I think of her when I use a separate spoon for jelly (to avoid crumbs in the jelly). I hear her voice answering the phone, happy to hear from me. 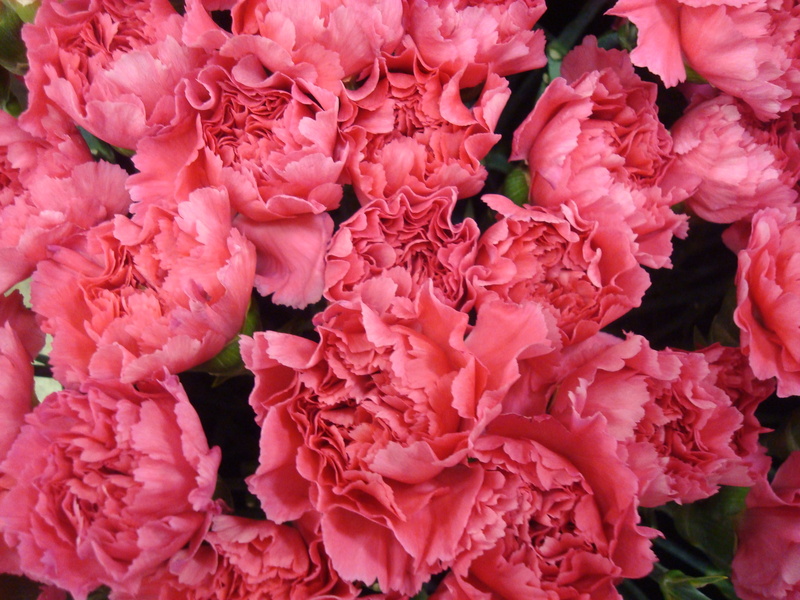 I put a vase of pink carnations in the kitchen, which undoubtedly was her favorite room of the house. On the surface, it might seem what she said on that last visit was a cry for attention. But my grandma never did anything on the surface. I know she was letting me know I shouldn’t have guilt or regret. She was reassuring me that I had done enough. Given her enough. She knew how much I loved her. That I would miss her desperately. And as always, she was right. Happy Birthday to your Grandmother. Your Grandmother reminds me of my mother, who’s birthday is the 21st. I’ve gone so far as to get a cake, candles and sing to her. My family thinks I’m nuts. I just miss her. Welcome back, hope you’re feeling better. Happy birthday to your mom, too. And don’t worry about your family, if your mom was like my grandma she would delight in the idea of such a ritual. P.S. Thank you – it’s good to be back. What a loving and poignant tribute to Grandma L.
She was what she was, God love her. What a tear jerker! Thanks for the lovely posting in memory of Grandma L.
This was a very wonderful and touching read. And I share your Grandmother’s birthday. Now I am going to go back and read this one again. I love your latest postings. You are truly a gifted writer. her everyday. Does it ever go away?